One Password to Rule Them ALL – Remember a single password to unlock the whole internet! It takes zero thought to push “Generate” – Never struggle again to meet some Byzantine rules, just hit the button. Reusing passwords across the web is like biking without a helmet – dangerous! Hackers steal corporate data, including your password, all the time. If you use the same password everywhere, one breach compromises all your accounts. Generated passwords are guess-proof. You ain’t gonna find qgeA2YygLG+ in the list of most common passwords that bots use to try to brute force into your account. Typing on a smartphone is lame – Even if you remember your passwords, typing them in on a phone is tedious. If your phone has a fingerprint scanner, you never have to type a password again! 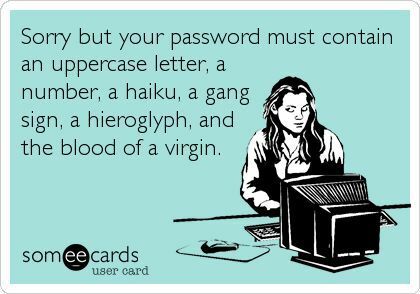 Now go out and get yourself a password manager! 1Password is our favorite, but there are several others here.